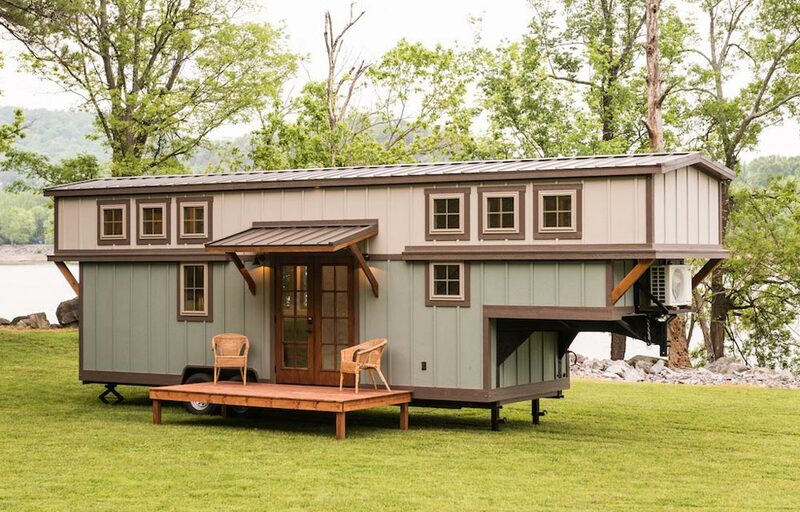 What is a gooseneck tiny home? These homes are built on a gooseneck trailer, which attaches onto a hitch in the bed of a truck instead of at the bumper. The gooseneck tongue typically ranges from five to ten feet long and sits a few feet above the main deck. The gooseneck tongue is most commonly used as the foundation for the master bedroom, allowing for more headroom than a traditional loft while still separating the bedroom from the main living area. There are normally four or five steps up into this section, rather than a full set of stairs or ladder. Why choose a gooseneck tiny home? Gooseneck trailers provide increased stability and enhanced maneuverability over bumper pull trailers, making them safer and easier to tow. With their better weight distribution, they also have higher weight carrying capacities. For those wanting a larger space while staying mobile, a gooseneck tiny home is most likely your best option. Below are several examples of gooseneck tiny homes from different builders. Photo Credit: The above photo is the Retreat by Timbercraft Tiny Homes.